The Weight Watcher: What is it all about? I'm in the 9th week of my Weight Watchers' journey now. While my losses have been great - with 31lbs lost, I'm aware that over the next few weeks, my losses will decrease and the hard work has to begin. I have been lucky so far - but I think that by keeping this blog, I will keep focussed on the goal at hand. Which is a current issue....My goal is a bit, erm, fluid. To put myself in a healthy BMI range, I need to weigh 147lbs or less. However, I am tempted to push my goal lower on the BMI scale - by setting my target at 133lbs. 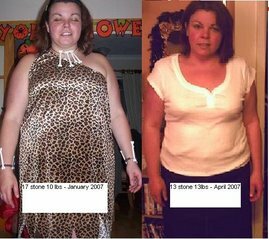 I need to do some research and put some thought into this as I have not weighed less than 150lbs for more than 20 years. But until I come to a final decision, I will continue concentrating on the 5 stone (70lbs) which remain between my current weight and 147lbs! I think I need to combat these problems by trying to get back into regular stirfries and home-made soups. Stirfries are not only filling, they are fantastic for getting veg portions in as well being low in points! I smell one coming on for tomorrow!